*Please note that [Kyoto station] is not nearest station. *It will take approximately 15-20 minutes by walking from Kyoto station. We are not a large house, but we make our best efforts every day for offering excellent stay. Inside the house is a very simple.The atmosphere in the house varies from day to day. For spending your free time, sharing a private laugh with other guests, or the like. Have a relaxing time in your own way. We hope that our guests stay at pleasant and enjoy Kyoto during the stay! 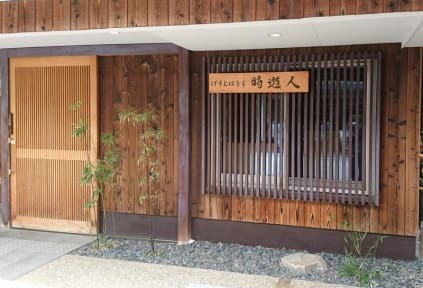 *Please note that our guesthouse is not traditional Japanese house (Machiya). *Please note that the entrance door is locked, and no staff is at reception during 11:00-16:00 and 21:00-8:00. *Our staff is not available from 21:00 to 8:00 and 11:00 to 16:00 at the front desk. -If you need any help, please contact us during reception hours . -Please check-in to the Guest House by 21:00. -We do not accept any check-in after 21:00. -However, if your arrival time will be later than 21:00 for 'INEVITABLE REASONS', please make sure to contact us in advance. -Once you check-in, you can come back anytime you want (no curfew). -Please let us know in advance if you would like to check out before 8:00. -We can temporarily keep your luggage for free before check-in and after check-out. ・Before check-in, please bring your luggage between 8:00 and 11:00. ・After check-out, please pick up your luggage between 16:00 and 21:00. *If you would like to leave the luggage between 11:00 and 16:00 (Closed time), there are coin-lockers in the Kyoto station. Please pay your accommodation tax in cash on the day of your arrival. -Each room can be locked from inside. -Each room has an air conditioner. -You can rent bicycle in here. When you use a bicycle (500 yen/day), you can go anywhere in Kyoto city. -There are Convenience store, Supermarket (24 hours open), Restaurant, public bath near us as well. -Payment should be made on the day of your arrival. Please pay the 'total amount' in cash. *We do not accept credit cards/debit cards. *Please make sure to exchange some currency into Japanese yen. -Please bring necessary amenities, such as towels, pajamas etc. *Bath-towels (150 yen) for rent and hand-towels (100 yen) and tooth brushes (50 yen) for sale at our guest house. -The bath and shower rooms are available at any time (except during cleaning time). -We do not accept guests under 13 years of age (Junior High School). -We do not provide any meals. -[Twin room] have double-deck beds (Not parallel). -[3 Bed Private Room] and [Basic Twin Room] is Japanese Style Room (TATAMI). Also,Futon (Japanese style-bedding) used in tatami room. -Please be considerate of others and try to keep noise levels down, especially after 22:00. Also, please understand that it is not a hotel. It is a guest house. Therefore, please excuse excess noise. -Before making reservations, please be aware that Jiyu-jin is not a hotel but a guesthouse. -Please be sure to check all the contents of our emails. -120 cm three-quarter beds (semi-double bed). *We do not provide any meals. *We cannot accept two guests to use single room. -208cm long bed, much longer than regular single-size bed. -Private room for 2 guests. -2 three-quarter beds (semi-double bed) are placed in both sides of the room. -FUTON (Japanese style-bedding) used in TATAMI room. *It is not real traditional Japanese room (Not Machiya). -Private room for 3 guests.